The idea of roads made of recycled plastic is not new. In India, for instance, It has proven to be an expedient and environmentally-friendly method for disposing of scrap plastic bottles and bags while improving the infrastructure of many communities. 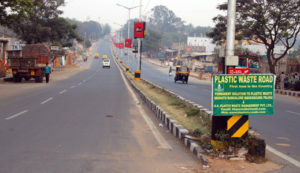 India’s model is the standard for plastic road development. It involves mixing waste plastic and bitumen. Here, various plastic scrap from materials like Polypropylene, Polyethylene and PVC are sorted, cleaned and shredded and then mixed with bitumen, the traditional substance used for road surfacing and roofing. After heating, the mixture is spread in the manner of ordinary asphalt. The success of plastic composite roads in India have led to construction in other countries. This is primarily because the technology is a significant improvement over traditional asphalt roads. Roads made of recycled plastic will be a significant opportunity for recyclers and the disposal of post-consumer waste in general. While companies like Volkerwessels and MacRebur are experimenting with roads made entirely of plastic scrap, their processes are still in development. Nevertheless, implementation is only a few years away. The evidence shows that roads made of recycled plastic in their entirety will be a vast improvement to current road construction methods. In particular, plastic roads would be built with separate pieces, allowing for speedy, identical replacements rather than melting and shaping tar to remove defects. Streets and highways made with interlocking plastic pieces that can be combined quickly will make road building faster and more efficient. Roads made of recycled plastic are considerably cheaper and have lower maintenance costs than the use traditional asphalt, and there is less erosion and need for repair. Another additional benefit of plastic roads is that they can be wired for power generation and heating. This technological advantage can not only melt snow and water, but it can be employed to keep the surface free from ice. Lastly, the environmental benefits of plastic road construction will make it a serious challenger to more traditional methods. Many plastics that are now incinerated or put into landfills will now be recycled for more useful purposes. While roads built entirely of plastic are still a few years away, their future is a promising one.